I love fishing, and teaching, the traditional Japanese method of tenkara using a light rod, fine tippet, and a sparse and simple soft-hackled fly. But the season for huge brown trout is just around the corner and one can only eat from a bento box for so long before he wakes up sweating in the middle of the night because a 25 inch fish is mocking the lo-cal snack at the end of your line. The Tenkarabugger remains my single most effective “guide fly” with clients who want to catch large trout on a tenkara rod. I tie it in black, olive, yellow, and purple; and always on a #4 drop shot hook*. This is the fly I would choose if I adopted a “one-fly” paradigm for tenkara fishing in the brawling rivers of Montana or Wyoming. 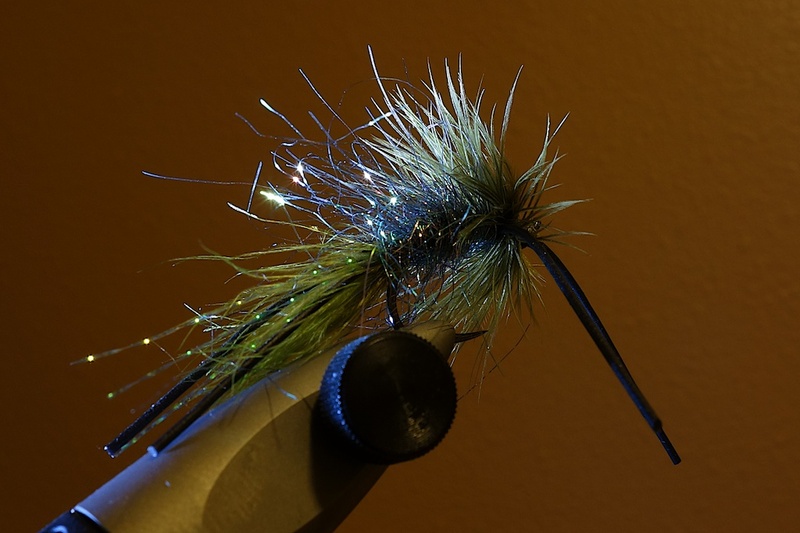 This is a killer fly for the deep runs and pools of the Yellowstone River at dusk in the big-brown sections between Livingston and Springdale, or for the Madison River in Yellowstone National Park when the browns are running in October. If you have to fish it on a Tenkara USA rod, try the Amago with a level line and stout (2X) tippet*, and hold on. Otherwise, think about what you might need to wade deep, fish deep, and enjoy a long drift so you can cover lots of water. My preference is a stiff (8:2), two-handed, 6 or 7m rod – which gives you better fly control and sensitivity for a drop-shot take. This isn’t Japanese mountain stream tenkara, by the way. It’s prospecting for trout in the five to ten pound range. My secret weapon is the Alpacka Dry Suit, and a PFD. Big rods, two hands, bushy flies, heavy tippet, split shot, drysuits (!) – call it what you want. The fish don’t care. Fished drop-shot style with a shot below it for deep pool drifting is a fantastic prospecting rig that gives you incredible fly control with a tenkara rod tip-and-line, and sensitivity for detecting the take. Fishing this way takes practice, nerves of steel, and perhaps a willingness to get a little wet when the game is on. It’s worth mastering if large browns are your target. * This may void your warranty. Use stout tippet and large flies at your own risk.